Status: Common, locally abundant, regular spring migrant statewide. Locally common regular breeder north-central, rare elsewhere. Common regular fall migrant statewide. Locally rare regular winter visitor south and east, rare casual elsewhere. Documentation: Specimen: UNSM ZM12449, 14 Apr 1909 Cass Co.
Taxonomy: No subspecies are recognized. This species was recently moved to genus Spatula from Anas, based on genetic studies (Chesser et al 2017). Earlier dates are of two on 9 Feb 2013 Branched Oak Lake, Lancaster Co, and two on 10 Feb Willow Creek Reservoir, Pierce Co. The first arrivals are typically in early Mar as water opens up. Numbers peak in Apr. Reports after about 10 Jun may indicate breeding. High counts: 3700 at North Platte SL, Lincoln Co 2 May 2004, 3300 at Harvard and Massie WPAs, Clay Co 9 Apr 2000, and 3000 at Carter Lake, Omaha 10 Apr 2014. Summer: Breeding may occur throughout the state (Ducey 1988), but most are found in the Sandhills and fewest in the south and east. 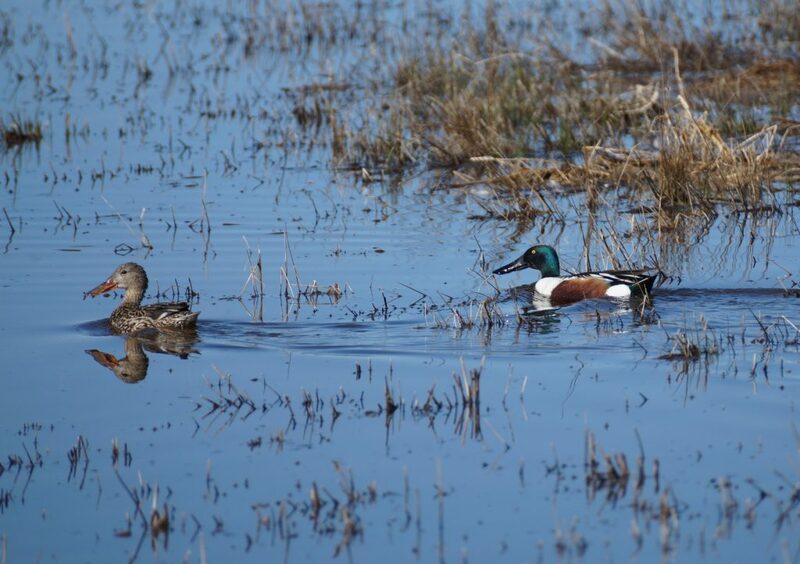 It is a rare breeder in the Rainwater Basin (Jorgensen 2012); Evans and Wolfe (1967) only located five Northern Shoveler nests out of 206 duck nests 1958-1962, and Harding (1986) found only eight nests out of 723 total duck nests in Clay Co 1981-85. The few recent reports of breeding in the Rainwater Basin are of a brood in 1999, two broods in 2001, and broods in Seward Co 16 Jul 2005 and 20 May 2007. Dependent fledglings: 20 May- 20 Jul. Individuals and small groups may undertake short distance movements ahead of primary migration and appear away from breeding areas by late summer. Males generally leave nesting sites to molt in groups nearby in late Jun and Jul (Baldassarre 2014); a flock of 29 near North Platte, Lincoln Co 19 Jun 2012 contained nine molting males undergoing pre-alternate molt into “eclipse” plumage (Howell 2010) and 20 females and juveniles. Primary migration commences in Sep and the species becomes more common and widespread; peak numbers are attained in mid- to late Oct. Numbers decline in Nov, but later reports are common, such as the 204 on 14 Dec 2002 in Scotts Bluff Co, and 56 at Harlan Co Reservoir, Harlan Co 18 Dec 1998. High counts: 2000 at North Platte SL 8 Oct 1996, “thousands” there 11 Oct 2005, and 1700 there 8 Dec 1999. Winter: Overwintering occurs most often in the North Platte River Valley, notably in Scotts Bluff and Lincoln Cos, but there are also multiple reports of overwintering at Alma, Harlan Co, where 4+ wintered 2001-2002 and where there are several other mid-winter reports, including 76 there 5 Feb 2000, and Carter Lake, Douglas Co, where up to 400 have wintered in the years 2011-2016. One wintered with Mallards at Jackson, Dakota Co 1995-96. There are these mid-winter reports elsewhere, some possibly of overwintering birds: up to 14 during 1-21 Jan 2018 at Lakeside Park, Omaha, 12 Jan 2010 Lincoln, Lancaster Co, 12 Jan 2013 Holmes Lake, Lincoln, and likely the same bird there 30 Jan, 13 Jan 2018 Cedar Co, 15 Jan 2000 Lincoln, Lancaster Co, 17 on 17 Jan 2000 Sioux and Dawes Cos, six on 28 Jan 2015 Lake Yankton, Cedar Co, two on 29 Jan 2012 Adams Co, 2 Feb 1997 Sarpy Co, 2 Feb 2018 Douglas Co, up to five 3-12 Feb 2014 Salt Creek, Lincoln, and 6 at Pier Park, Grand Island 8 Jan 2019. Northern Shovelers, Sheridan Co, 13 Apr 2016. Photo by Joel G. Jorgensen. Photograph (top) of a Northern Shoveler at Fontenelle Forest, Sarpy Co, on 6 Apr 2011 by Phil Swanson.